Last month, after years of discussion and a £120 million loan from China, Zimbabwe’s Victoria Falls International Airport was finally opened by President Robert Mugabe. There are no direct flights from the UK as yet, but with a runway capable of handling the world’s largest planes, plus 28 aircraft docking bays which could triple the capacity of the old airport to 1.5 million passengers a year, it looks set to usher in a new era of tourism for Zimbabwe. When I landed there from Johannesburg a few weeks before the official opening, there was already a buzz in the air – particularly at the Victoria Falls Hotel, where the patio restaurant was full of diners in celebratory mood. One official told me that between 3,000 and 5,000 visitors are arriving by foot each day on the Zimbabwe side of the falls (which straddle the border with Zambia), a clear sign that the country is back on the tourism map. The number of arrivals should increase dramatically now that the airport is complete. What can visitors expect? On the one hand, “Zim” is spectacular, a place the BBC’s former Africa correspondent Michael Buerk called “the most beautiful country on the continent”. It has impressive natural features: mighty rivers (the Zambezi and Limpopo), game-filled plains (at Mana Pools), a lake half the size of Belgium (Kariba), a national park the size of Wales (Hwange) and boulder-strewn hills adorned with ancient San art (Matobo). But it is also a country that has seen horrific genocide, its people brutally suppressed by politicians who have tried to quash democracy, destroying a once-thriving agricultural economy and creating hunger, homelessness and 80 per cent unemployment. Despite all this, Zimbabweans are positive people, their motto being “We’ll make a plan”. Now that Robert Mugabe is 93, their plan – of a country without him – is gaining momentum. Tourism will be a big part of that. I have been back to Zimbabwe every year for the past three decades, to visit the country of my birth. On my latest trip, I was amazed by the number of old friends returning to tourism as a way of making a living. 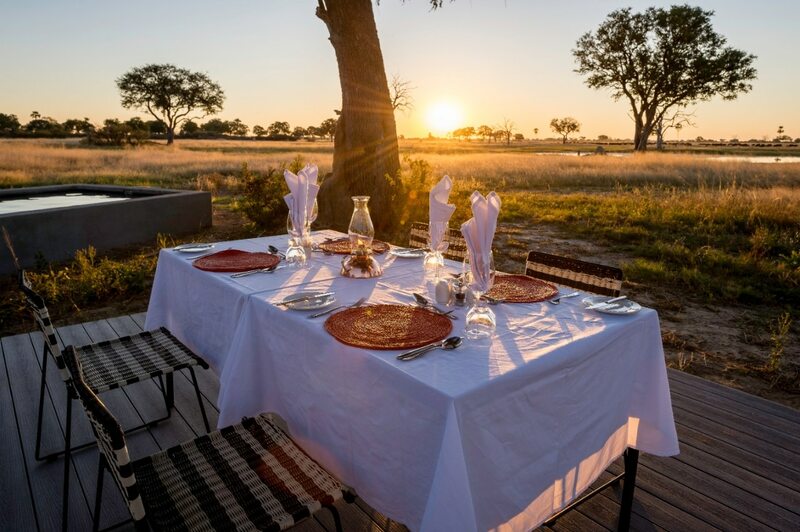 Over two weeks, every camp I stayed in was full of international guests, enjoying an experience every bit as enriching as in any other southern African country – and substantially cheaper than neighbouring Botswana or Zambia. For those who want to see more of the country, new internal flights on the low-cost FastJet airline, together with private aviation companies, make this possible. I combined flying and driving around the country’s three biggest tourist destinations – Victoria Falls, Hwange and Lake Kariba. Here is my guide to the highlights. One of the Seven Natural Wonders of the World, this is the world’s greatest mass of falling water. Some 5,633ft wide and 343ft tall, the falls are as impressive today as when David Livingstone wrote that “scenes so lovely must have been gazed upon by angels in their flight”. 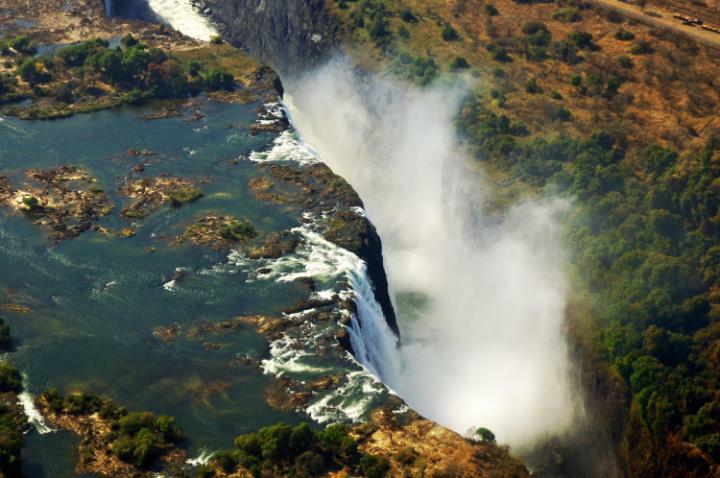 On the Zimbabwean side there are far more viewpoints (16) than in Zambia, including one above the thundering Devil’s Cataract and four facing Main Falls, where at peak season more than 27 million cubic feet of water fall per minute, drenching onlookers. On the Zimbabwean side of Victoria Falls there are far more viewpoints than in ZambiaCREDIT: F.C.G. – FOTOLIA/F.C.G. 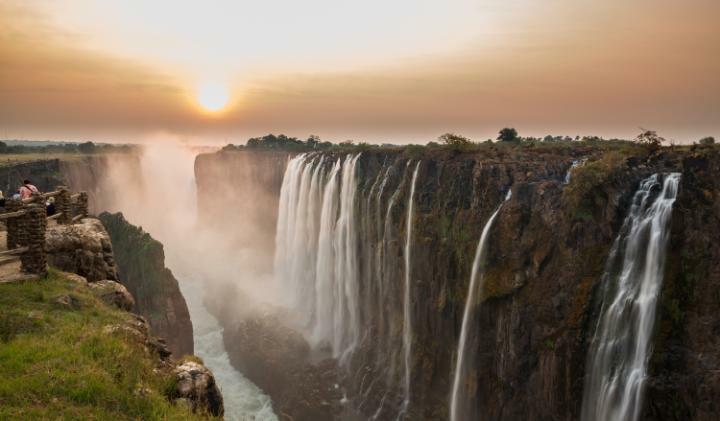 Because Victoria Falls has been a hub of tourism for decades, there are lots of activities on offer, from bungee jumping, abseiling and white-water rafting to diving with crocodiles. For the less adventurous, there are craft-shopping trips and sunset cruises. While first-timers might prefer to stay in the town – at the relaxed Ilala Lodge (ilalalodge.com), the glamorous colonial Victoria Falls Hotel (victoriafallshotel.co) or the family-friendly Victoria Falls Safari Lodge (africaalbidatourism.com), new camps have been built just a 45-minute drive out of town – a welcome option for those who prefer to get away from it all after they have seen the falls. 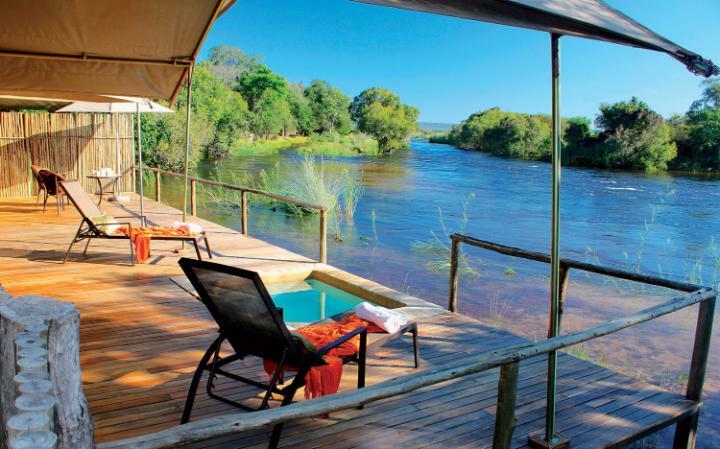 Zambezi Sands, a bush camp on a remote stretch of the Zambezi river, was created by conservationist Mark Butcher. He has been protecting Zimbabwe’s wilderness for decades, both as a national parks ranger and through his community-based Imvelo Safaris group (imvelosafarilodges.com), to which Zambezi Sands belongs. 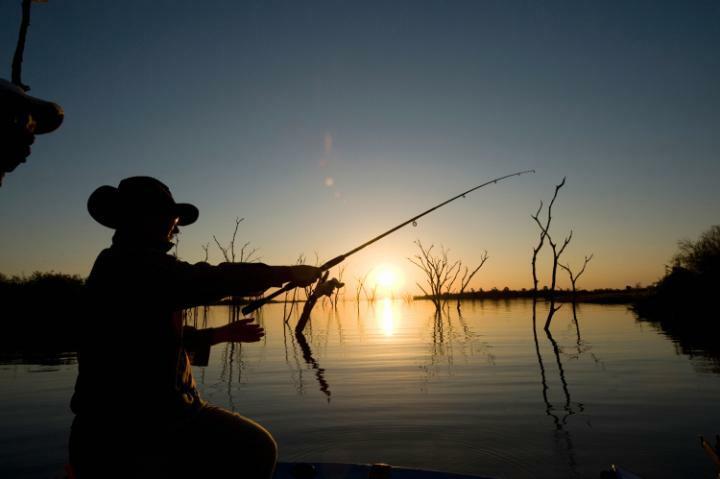 Butcher knows the falls area intimately and can arrange almost any activity, from fly-fishing for tigerfish to photographing lunar rainbows over the falls at night. On this tranquil bend in the river, hippos snort and luminous blue kingfishers swoop. 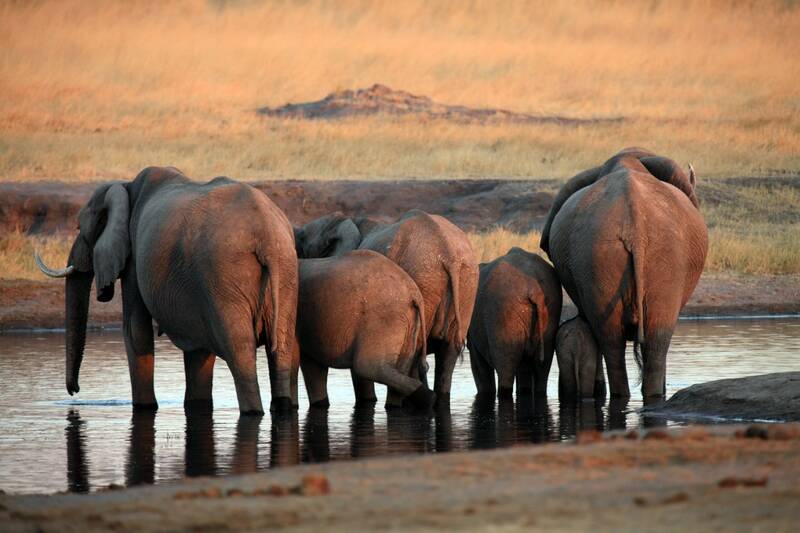 In the surrounding Zambezi National Park, plentiful wildlife roams. Days can be spent on game drives (mainly for elephant), walking through forests of Jackalberry and palm, fishing or canoeing with naturalists or affable camp managers. This elegant, contemporary camp operates like a friendly boutique hotel. Its eight enormous Bedouin tents are on timber decks, with a plunge pool, outdoor shower, living area and bathroom with roll-top bath. The big communal living room has colonial-style furnishings, the wide deck outside features a firepit (a cosy spot for stargazing) and the outdoor dining tables are in the daytime shaded by big cream umbrellas. The food is fresh, inventive and presented with pride by 27-year-old chef Frankie Banda. 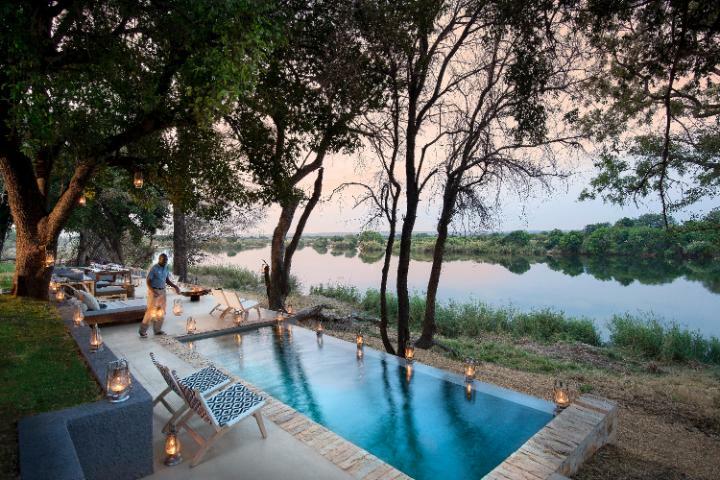 For real luxury, Matetsi River Lodge (andbeyond.com) offers the best of all worlds: big elegant rooms, a wine cellar and spa, as well as water activities and game viewing. The 13 new tents at the Victoria Falls River Lodge (victoriafallsriverlodge.com) are airy and contemporary, with private plunge pools – but views are of the outskirts of Livingstone in Zambia, so the camp doesn’t feel remote. The Elephant Camp (theelephantcamp.com) is highly recommended, but it is in the bush rather than on the river. 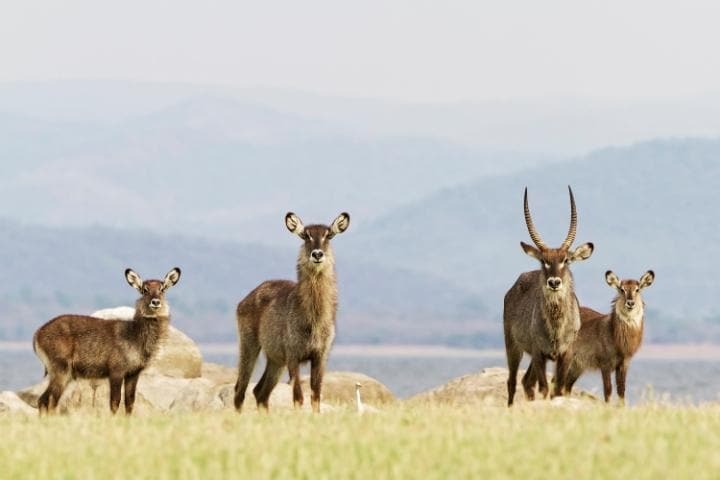 This game park is not just huge – 5,625 square miles, about nine times the size of Greater London – but also boasts a wider variety of wildlife than anywhere else in Africa. As well as an estimated 50,000 elephants, in herds as large as 400, it is home to more than 100 species of mammal and 400 types of bird – a biodiversity to match that of the Kruger National Park in South Africa or South Luangwa in Zambia, but with fewer people, camps and cars. What game you see depends on the area. In the hillier north-west (near Sinamatela, Nahimba and Camp Hwange), wild dogs are common. In the centre, near Main Camp, lions are frequently spotted, including prides that have perfected the art of elephant hunting. In the south-east, grassy vleis attract a staggering range of game. Over four days in the central area, staying at three camps, I saw elephants, lions, a cheetah with three cubs, big herds of buffalo and giraffe, as well as relatively rare sable, eland and roan, and birds ranging from a giant verrose owl, with its distinctive pink eyelids, to the tiniest golden shaft-tailed whydah, trailing long glossy feathers to attract a mate. Sleeping just 12, Little Makalolo is contemporary in style, with six mesh-walled tents containing shabby-chic furnishing. It feels more like a friendly little bush home than a luxury camp, and is set beside a watering hole where so many wild animals congregate that at night you are accompanied to your tent by an armed ranger. Tents feature deep copper basins, outdoor showers open to the stars, comfortable beds with crisp white linen, and strong reading lights (a rare but much-appreciated extra). The Hide (thehide.com), a homely thatched camp built by the Preston family in 1992, is set on a private two-square-mile concession on the park’s edge. Its 10 thatched A-frame rooms are well laid out, with shaded verandas, practical shelving and, in the honeymoon suites, outdoor baths and double showers. Head guide Nicholas Gaunje has worked for the family for 13 years, and imparts knowledge with sensitivity and dry humour, whether on a walking safari, a sleep-out in the Dove’s Nest treehouse, or a night drive (allowed on the concession). This is one of the biggest man-made lakes in the world, like an inland sea covering an area roughly the size of Wales. When it was created in 1958 to generate hydroelectricity, more than 1,700 animals were rescued by conservationists from the rising waters and relocated to the adjacent Matusadona National Park. Today the 540-square-mile park teems with wildlife and has just three places to stay within it: Rhino Safari Camp (rhinosafaricamp.com) in the north, a haunt of fishermen; Spurwing Island (spurwingisland.com), a favourite with families; and Changa Safari Camp, a smart new camp on a peninsula in the east. 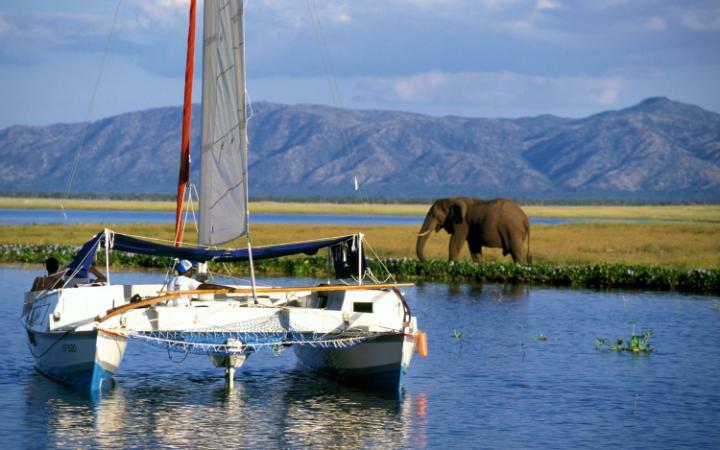 Lake Kariba is a place where there is little to do but take in the big skies, the spectacular escarpment that stretches all the way to the Rift Valley, large expanses of water and the rich diversity of wildlife on its shores. Activities revolve around water: watching birds, elephants, buffaloes and sometimes lions from a small speedboat; taking an atmospheric sunset cruise; kayaking (while looking out for hippos and 14ft-long crocodiles more than a century old) and fishing for bass, catfish and prized tigerfish. Changa Safari Camp (changasafaricamp.com) is located on the shores of Matusadona National Park. Owners Kevin Higgins and Angus Preston are keen conservationists intent on eradicating poaching, which is prevalent here. This they hope to achieve through their new NGO, the Matusadona Anti-Poaching Project (MAPP), and by attracting tourists back to enjoy Zimbabwean wildlife. The camp – 23 miles from the main Kariba harbour – can be reached in 40 minutes by Avoca Transfers’ 16-seater speedboat, or in 20 minutes by plane to Fothergill Island. Whichever option you take, the journey there is an adventure in itself; we saw elephants before we had even reached the camp. Like the Hide, Changa has been designed by people who understand what makes a safari pleasurable. The eight tents – two of which can accommodate a family of four – are large and well spaced out, with shaded verandas, comfy living spaces and bedrooms enclosed by big mesh windows which keep out bugs without cutting off the views. There are several places in which to socialise, too: a bar shaped like a boat for sundowner G&Ts; a plunge pool surrounded by shaded bandas; a living area with a library and squashy sofas; and a dining space where the chef creates delicious buffets, from Cape pickled fish and Neapolitan meatballs to inventive salads and fresh fruit platters, all served with South African wines. 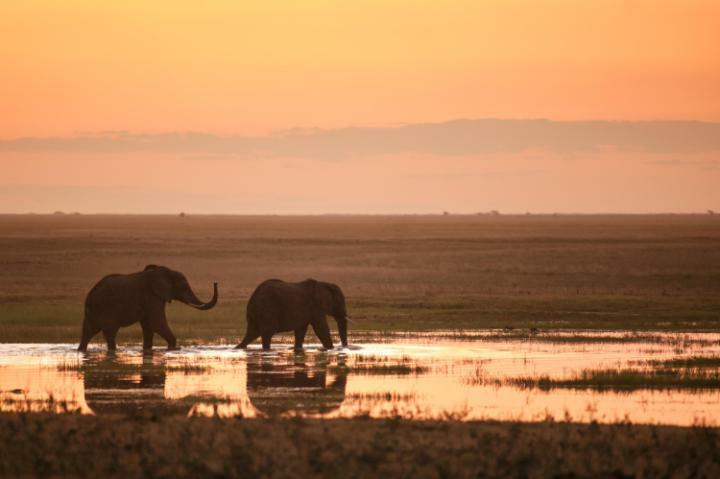 Most guests spend their time either out on the water, G&T in hand, or walking on the shores with an armed guide, seeing elephants, buffaloes and occasionally lions. Hire a houseboat. Arguably the most glamorous is the Matusadona (mv-matusadona.com), sleeping up to six.